The theoretical maximum efficiency of Class-D designs is 100%, and over 90% is attainable in practice. Note that this efficiency is high from very moderate power levels up to clipping, whereas the 78% maximum in Class-B is obtained at the onset of clipping. An efficiency of less than 50% is realised in practical use with music signals. The PWM amp's high power efficiency translates into less power consumption for a given output power but, more important, it reduces heat-sink requirements drastically. 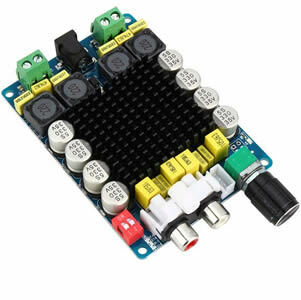 Anyone who has built or seen a high-powered audio amplifier has noticed that big aluminium extrusions are needed to keep the electronics relatively cool. The loading on the power transformer is also reduced by a substantial amount, allowing the use of a smaller transformer for the same power output. 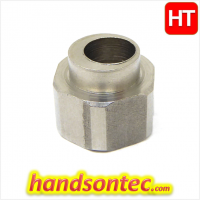 These heat-sinks account for an important part of the weight, cost and size of the equipment. 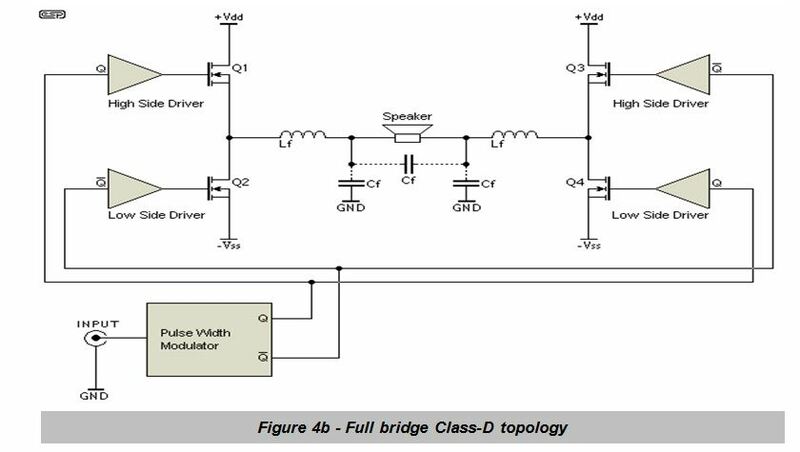 As we go deeper in the details of this topology, we will notice that a well behaving (low distortion, full range) Class-D amplifier must operate at quite high frequencies, in the 100KHz to 1MHz range, needing very high speed power and signal devices. This has historically relegated this class to uses where full bandwidth is not required and higher distortion levels are tolerable - that is, subwoofer and industrial uses. However, this has changed and thanks to today's faster switches, knowledge and the use of advanced feedback techniques it is possible to design very good performance Class-D amplifiers covering the whole audio band. 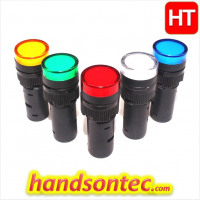 These feature high power levels, small size and low distortion, comparable to that of good Class-AB designs. (From now on, we will refer to Class-A and AB topologies as "classical"). From the DIY perspective, Class-D is rather unfortunate. Because of the extremely high switching speeds, a compact layout is essential, and SMD (surface mount devices) are a requirement to get the performance needed. 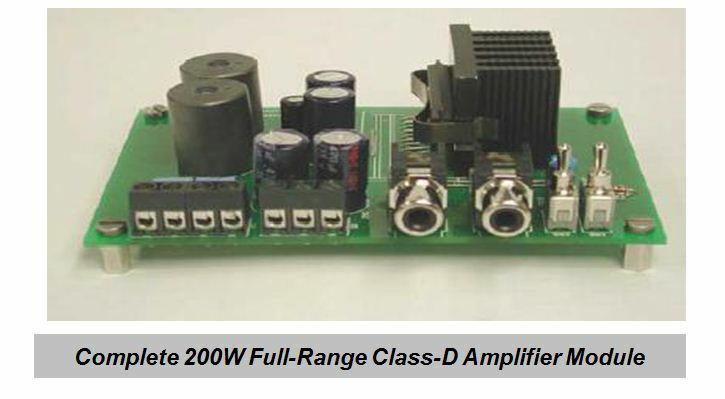 The stray capacitance and inductance of conventional through-hole components is such that it is almost impossible to make a PWM amplifier using these parts. Indeed, the vast majority of all ICs used for this application are available only in surface mount, and a look at any PWM amplifier reveals that conventional components are barely used anywhere on the board. Since SMD parts are so hard to assemble by hand and the PCB design is so critical to final performance, DIY versions of PWM amps are very rare indeed. 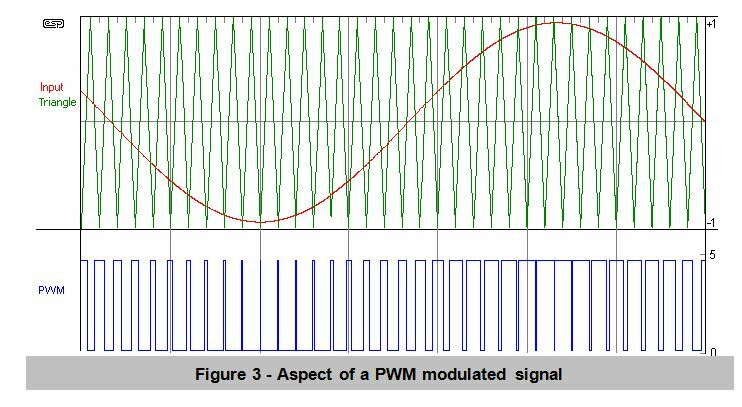 PWM is usually generated by comparing the input signal with a triangle waveform as shown in Figure 2. The triangle wave defines both the input amplitude for full modulation and the switching frequency. Note that full bridge PWM amp needs only one supply rail - bipolar supplies are not necessary, but can still be used. 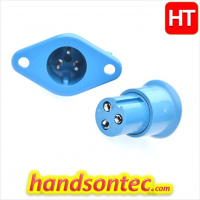 When a single supply is used, each speaker lead will have ½ the Vdd voltage present. 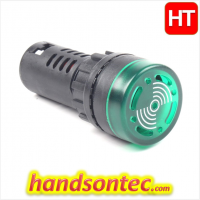 As it is connected differentially, the loudspeaker doesn't see any DC if everything is well balanced. However, this can (and does) cause problems if a speaker lead is allowed to short to chassis! The filter may be implemented by means of a single capacitor across the loudspeaker, by a pair of caps to ground, or in some cases by both (as shown by the dotted lines connecting the caps). Note that the schematics shown use both N-channel MOSFETs. Although some designs use N and P channel complementary devices, that is IMHO sub-optimal due to the difficulty of obtaining suitable P devices and matched pairs. So lets concentrate on N-channel only half-bridges. Note that, in order to drive a MOSFET on, a voltage above Vth must be present between its gate and source. The lower MOSFET has its source connected to -Vss, so its drive circuit has to be referred to that node instead of GND. A basic level shifting function can be performed with a single or two-transistor circuit similar to the one depicted in Figure 6 (before the high side driver). While this may work at low frequencies, it is important to simulate the behavior of the comparator and level shifter, as they can introduce considerable delays and timing errors if not properly designed. 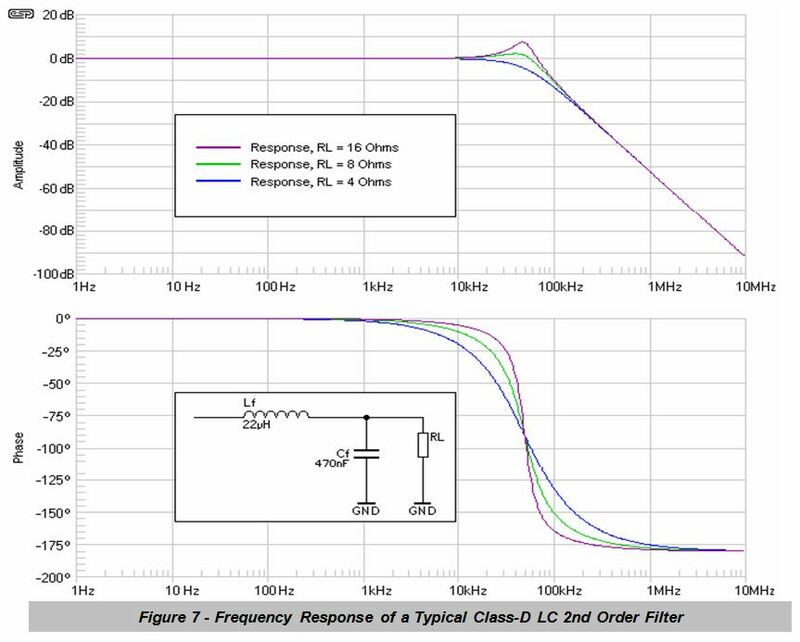 Well designed Class-D amplifiers have a higher order filter and/or special carrier suppression sections in order to avoid problems with EMI. As can be seen in Figure 8, the response is dependent on the load, and in fact the load is part of the filter. This is one of the problems to solve in Class-D designs. It doesn't help that a loudspeaker presents a completely different impedance to the amplifier than a test load, and many PWM amps have filters that are (and never can be) correct for all practical loudspeaker loads. Again, only a handful of good Class-D amplifiers use feedback techniques that include the output filter to compensate for impedance variations and have a nearly load independent frequency response, as well as to reduce distortion produced by non-linearities in the filter. Although passive components are thought to be distortion-free, this does not apply to ferrite or powdered iron cores that are used for the filters. These components most certainly do introduce distortion. The ideal inductor (in terms of linearity) is an air-core one, but the size and number of turns required for typical Class-D operation usually makes it impractical, so a core is normally used in order to reduce turns count and also provide a confined magnetic field that reduces radiated EMI. Powder cores or equivalent materials are the common choice. It can also be done with ferrite cores, but they must have a "gap" where energy is stored. Wire size must also be carefully chosen so DC losses are low (requiring thick wire) but also skin effect is reduced (AC resistance must also be low). Inductor core shape can be a drum core, gapped ferrite RM core, or toroidal powder core, among others. Drum cores have the problem that their magnetic field is not enclosed, hence producing more radiated EMI. RM cores solve this problem but have most of the coil enclosed, so cooling problems may arise as no airflow is possible. IMHO, toroids are preferred because they feature both closed magnetic field that helps control radiated EMI, a physically open structure that allows proper cooling, and easy and economical winding, as they don't need bobbins. As we have stated previously, timing errors can lead to increased distortion and noise. 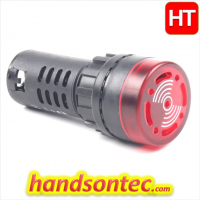 This cannot be skipped and the more precise it is kept, the better the design will perform. Anyway, open loop Class-D amplifiers are not likely to satisfy demanding specifications, so (negative) feedback is almost mandatory. There are several approaches. 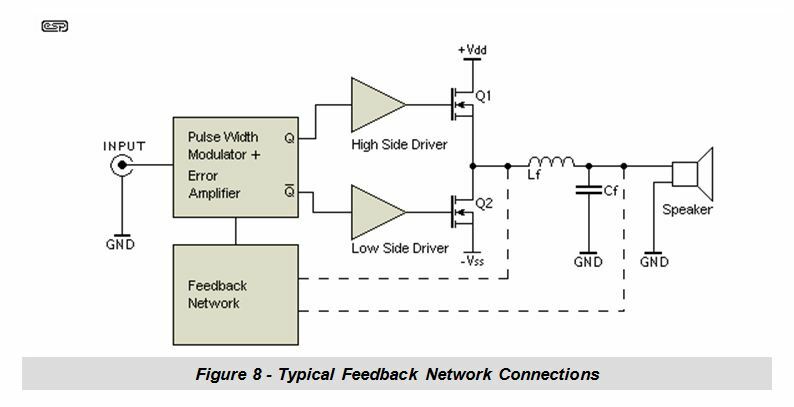 The most simple and common is to take a fraction of the switching signal, precondition it by means of a passive RC low pass filter and feed it back to the error amplifier. To put it simply, the error amplifier is an op-amp placed in the signal path (before the PWM comparator) that sums the input signal with the feedback signal to generate a error signal that the amps automatically minimises (this is the concept of every negative-feedback system, anyway). 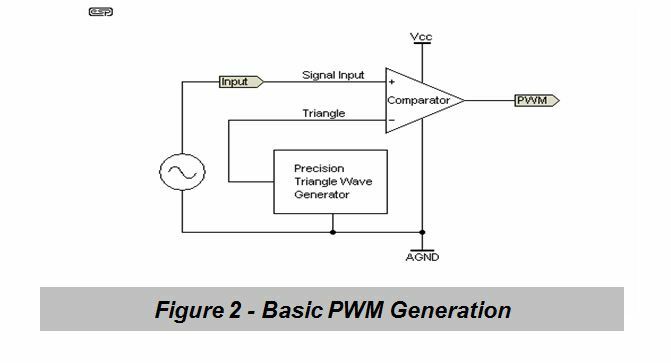 Pure PWM (based on triangle generators, also called 'natural sampling PWM') is not the only way to go in order to construct a Class-D amplifiers. Some other topologies have arisen, many of them based on auto-oscillation, where the hysteresis in the comparator and delays between the comparator and power stage can be taken into account to design a system that oscillates by itself in a somewhat controllable manner. Although simpler, these designs have some disadvantages, IMHO. For example, the switching frequency is not fixed, but depends on the signal amplitude. This makes output notch filters ineffective, yielding higher ripple levels. Besides, when several channels are put together, the difference in switching frequency between them can produce audible beat tones that can become very annoying. This can also happen of course with synchronous design as the one described here, but there is a simple solution - use the same clock for all the channels. Self oscillating designs in particular have some other difficulties like start-up: special circuitry may be needed that forces the amplifier to start oscillating. Conversely, if for any reason the oscillation stops, you could end up with an 'always-on' MOSFET, and thus a large amount of DC at the output, followed almost immediately by a dead loudspeaker. Of course, these issues can be solved with proper design, but the added complexity can void the initial simplicity, thus no gain is obtained. Low distortion in a PWM amplifier requires a very linear triangle waveform, along with a very fast and accurate comparator. At the high operating frequencies needed for optimum overall performance, the op-amps used need to have a wide bandwidth, extremely high slew rate, and excellent linearity. This is expensive to achieve, requiring premium devices. Some of these constraints are relieved somewhat by self oscillating designs (therefore making them slightly cheaper), but this is not an effective trade-off for the most part. This article has been written in order to throw some light about the internals, advantages and difficulties of this not very well-known (and even less well understood) technology. Everyone thinks that "Class-D" stands for "Digital". We hope that after reading this article, no-one thinks that any more. Download this application note in pdf.